Sometimes time is of the essence and you need to get a beautiful, functional site online fast. If that’s your situation, BoldGrid and InMotion Hosting make things simple by taking tricky decisions out of the picture and giving you tools to build a great WordPress site quickly and easily. 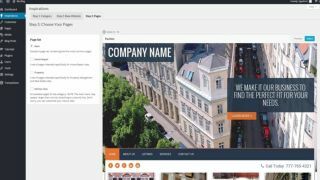 BoldGrid is a suite of plugins bundled with InMotion Hosting that makes building a WordPress site easy for business owners or beginners, and faster and more practical for WordPress designers. Even if you’re starting from scratch InMotion Hosting can handle every part of the process, including domain registration, and put you in a position to get a simple site using proven UI patterns online within hours. You can then iterate upon your design and add content until it’s just right. Here’s how it works: once you’ve purchased your hosting plan, all you need to do is log in and install BoldGrid, which is just one click. Now you’ve got access to a selection of modern, responsive WordPress templates suitable for various industries and purposes that you can customise instantly via a simple drag-and-drop interface. To avoid the writers’ block that often comes with a blank canvas, the templates are pre-filled with images and copy that you can edit and make your own. BoldGrid is integrated with Fotolia and Flickr so you have direct access to thousands of images that can be dropped straight into your site. Even colour palettes are built-in; you can choose from a range of existing palettes or select your own starting colours and let the system suggest a matching palette. There’s technical support to help you every step of the way, and built-in staging so you can make sure your work is right before going live. If you’re a WordPress pro, BoldGrid helps you to put your designs together faster and more easily. The Gridblocks functionality enables you to drag and drop blocks of content so you can easily rearrange layouts, and you can also insert galleries and forms without using shortcode. You can import your own themes and third party plugins, and BoldGrid generates clean code that’s easy to navigate and customise. If you’re a professional designer you’ll find using BoldGrid with InMotion Hosting speeds up your workflow, and if you’re a business owner it will enable you to build your own site in just a few hours.